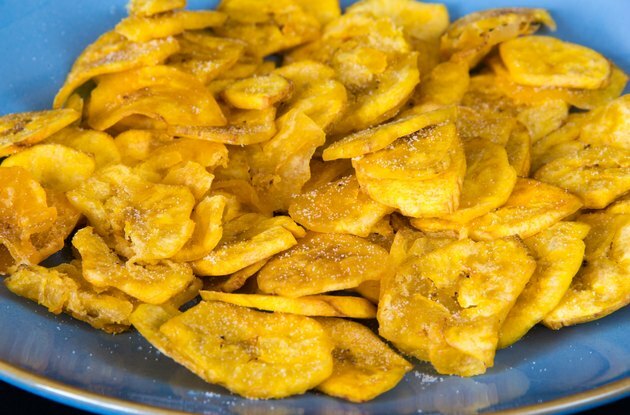 While plantain chips may seem like a healthy alternative to potato chips or other greasy snacks, the truth is that they're high in fat and calories and provide few essential nutrients. On the plus side, however, they do contain fiber and are typically low in sodium. Nonetheless, you're better off snacking on fresh fruits or vegetables instead of their processed counterparts. Just like potato chips, plantain chips are deep-fried, making them very high in fat. Fat contains more than double the calories of carbohydrates or protein, which helps explain why both potato chips and plantain chips may contain about 150 calories per ounce. Some versions are somewhat lighter; for example, one brand of plantain chips contains a little less than 120 calories per ounce. However, that's still far more calories than you'll find in the same amount of raw plantain. Plantains are high in fiber, and each ounce of plantain chips may contain 8 to 12 percent of the daily value for this nutrient -- about two to three times what you'll get from potato chips. Most Americans don't get enough fiber, and a deficiency can lead to digestive problems such as constipation. Fiber also slows digestion to help you feel fuller on fewer calories and may also help prevent chronic illnesses such as diabetes and heart disease. Plantain chips aren't particularly rich in vitamins and minerals. For example, one brand contains 2 percent of the DV for vitamin A and 6 percent of the DV for vitamin C per ounce, but no significant amount of other micronutrients like iron and calcium. Fried fruits typically contain fewer vitamins than fresh versions because some nutrients -- particularly water-soluble vitamins such as vitamin C -- degrade with exposure to heat. In the sodium department, plantains have a clear advantage over potato chips and other salty snacks. While a serving of potato chips may contain 128 milligrams of sodium, a serving of plantain chips may have just 30 to 50 milligrams. This is important because high sodium intake is linked to high blood pressure -- a contributor to heart disease and stroke -- and most Americans consume far too much sodium in their diets, mainly from processed foods. The Centers for Disease Control and Prevention recommends that most people limit sodium to not more than 2,300 milligrams per day and that those at increased risk for heart disease limit sodium to not more than 1,500 milligrams per day. How Many Calories Are in Caramel Popcorn? What Is the Calorie Count of Sherbet & Ice Cream?